Dickinson Preserve - Haddam Land Trust, Inc. 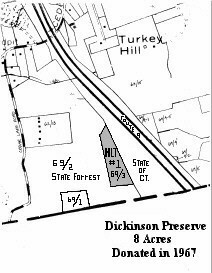 The Dickinson Preserve was the first land donation to the Haddam Land Trust. It was donated in 1967 by Shirley Dickinson. The Preserve is 8 acres and is landlocked, just North of the Haddam/Chester line, between Route 9 and Cedar Lake Road.